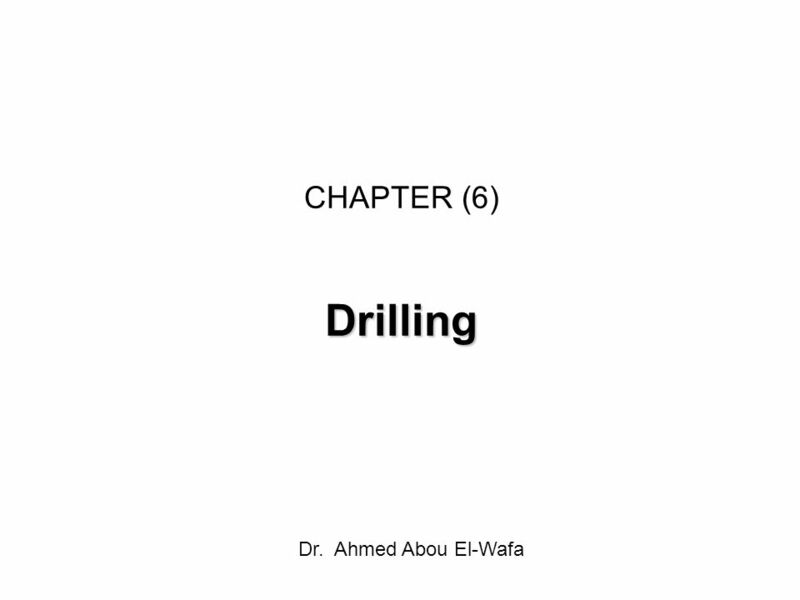 CHAPTER (6) Drilling Dr. Ahmed Abou El-Wafa. 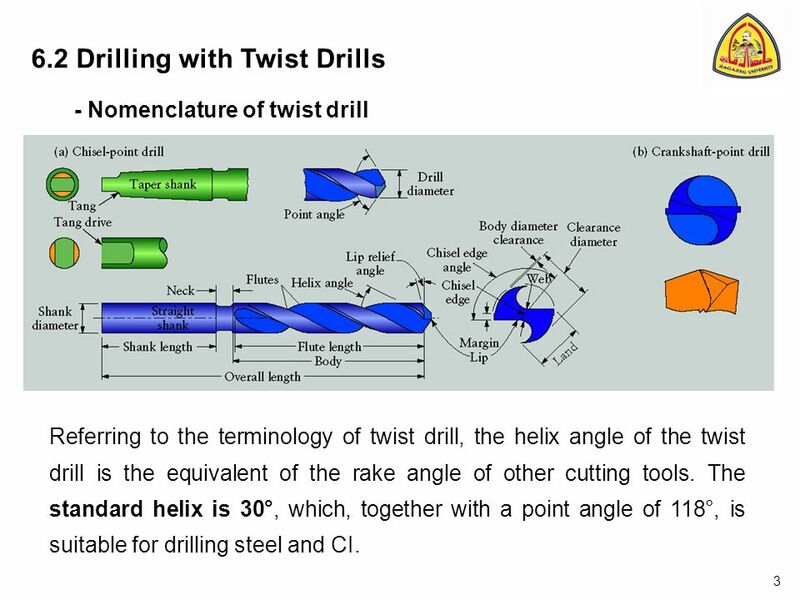 - Nomenclature of twist drill Referring to the terminology of twist drill, the helix angle of the twist drill is the equivalent of the rake angle of other cutting tools. The standard helix is 30°, which, together with a point angle of 118°, is suitable for drilling steel and CI. Friction makes matters worse in two ways. In addition to the usual friction between the chip and the drill, friction also results from rubbing between the outside of the drill and the hole wall. This generates heat, which causes the temperature of the drill and work to rise. Delivery of cutting fluid to the drill point is difficult because the chips are flowing in the opposite direction. 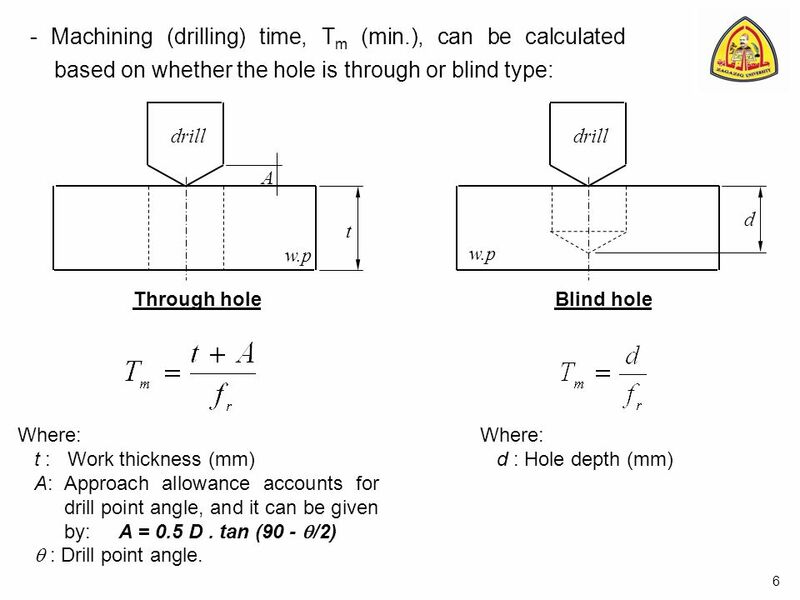 Because of chip removal and heat, a twist drill is normally limited to a hole depth no greater than four times its diameter. 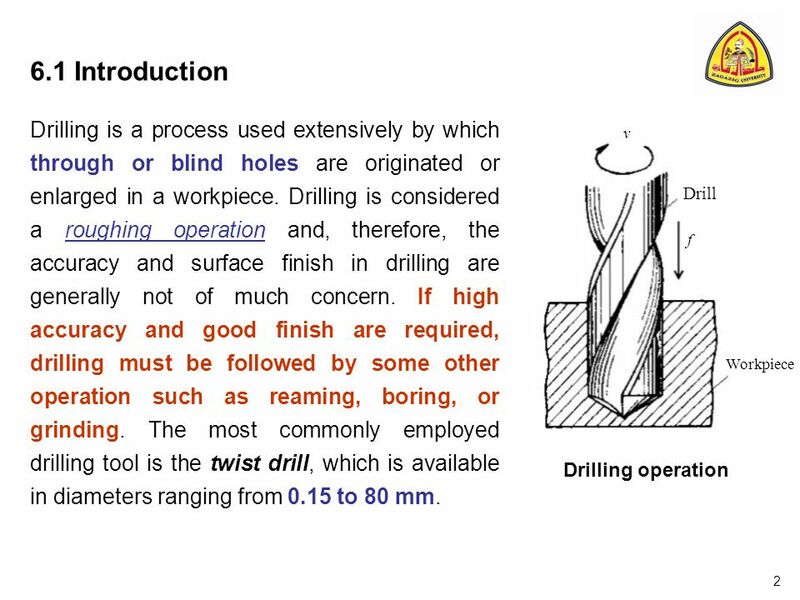 Some twist drills are made with internal holes running through their length which cutting fluid can be pumped into the hole near the drill point. 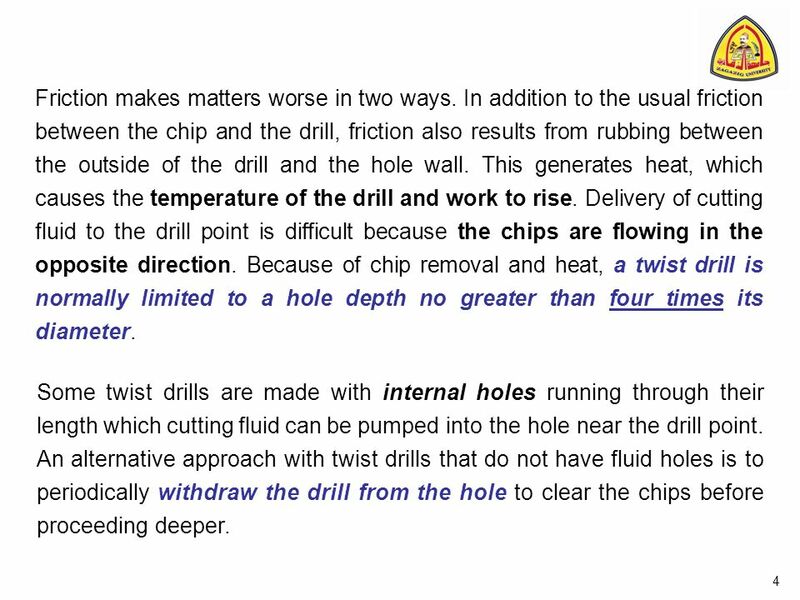 An alternative approach with twist drills that do not have fluid holes is to periodically withdraw the drill from the hole to clear the chips before proceeding deeper. - Reaming: Reaming is used to slightly enlarge a hole, to provide a better tolerance, and to improve its surface finish. The tool is called a reamer. - Tapping: This operation is performed by a tap and is used to provide internal screw threads on an existing hole. 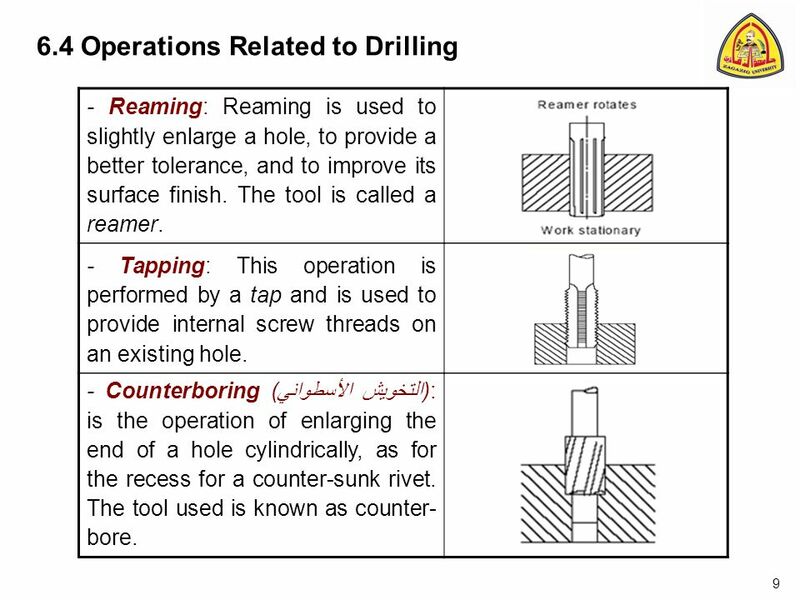 - Counterboring (التخويش الأسطواني): is the operation of enlarging the end of a hole cylindrically, as for the recess for a counter-sunk rivet. The tool used is known as counter-bore. 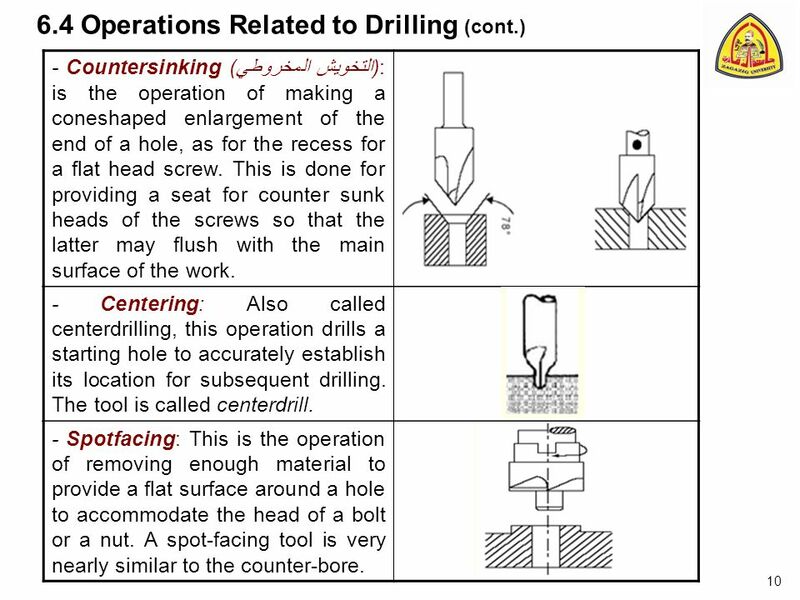 - Countersinking (التخويش المخروطي): is the operation of making a coneshaped enlargement of the end of a hole, as for the recess for a flat head screw. This is done for providing a seat for counter sunk heads of the screws so that the latter may flush with the main surface of the work. 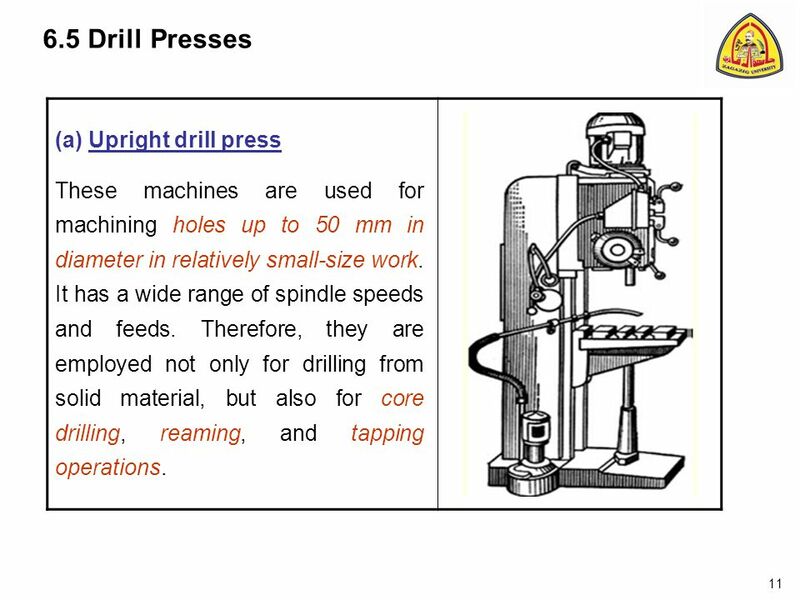 - Centering: Also called centerdrilling, this operation drills a starting hole to accurately establish its location for subsequent drilling. The tool is called centerdrill. - Spotfacing: This is the operation of removing enough material to provide a flat surface around a hole to accommodate the head of a bolt or a nut. A spot-facing tool is very nearly similar to the counter-bore. These machines are used for machining holes up to 50 mm in diameter in relatively small-size work. It has a wide range of spindle speeds and feeds. Therefore, they are employed not only for drilling from solid material, but also for core drilling, reaming, and tapping operations. These machines are especially designed for drilling, counterboring, countersinking, reaming, and tapping holes in heavy and bulky WPs that are inconvenient or impossible to machine on the upright drilling machines. 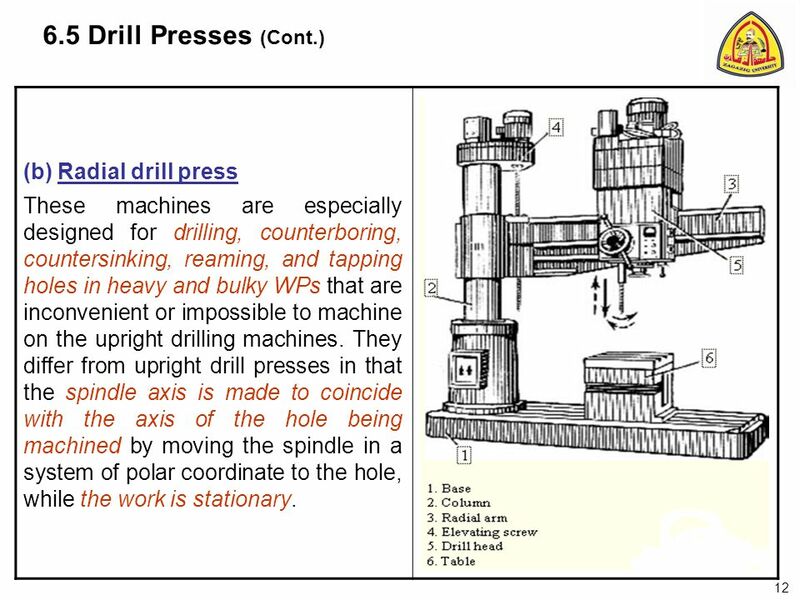 They differ from upright drill presses in that the spindle axis is made to coincide with the axis of the hole being machined by moving the spindle in a system of polar coordinate to the hole, while the work is stationary. The spindles are arranged in a row, and each spindle is driven by its own motor. The gang machine is in fact several upright drilling machines having a common base and single worktable. They are used for consecutive machining of different holes in one workpiece, or for the machining of a single hole with different cutting tools. 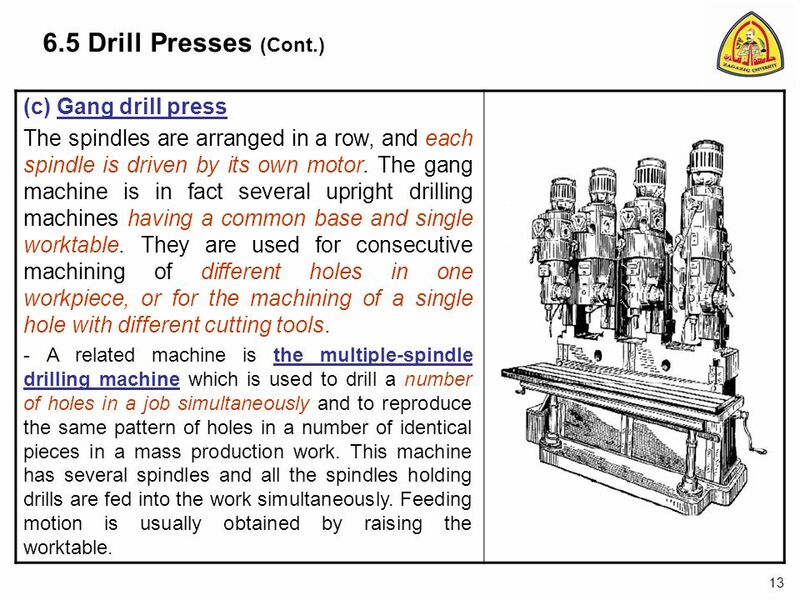 - A related machine is the multiple-spindle drilling machine which is used to drill a number of holes in a job simultaneously and to reproduce the same pattern of holes in a number of identical pieces in a mass production work. This machine has several spindles and all the spindles holding drills are fed into the work simultaneously. Feeding motion is usually obtained by raising the worktable. 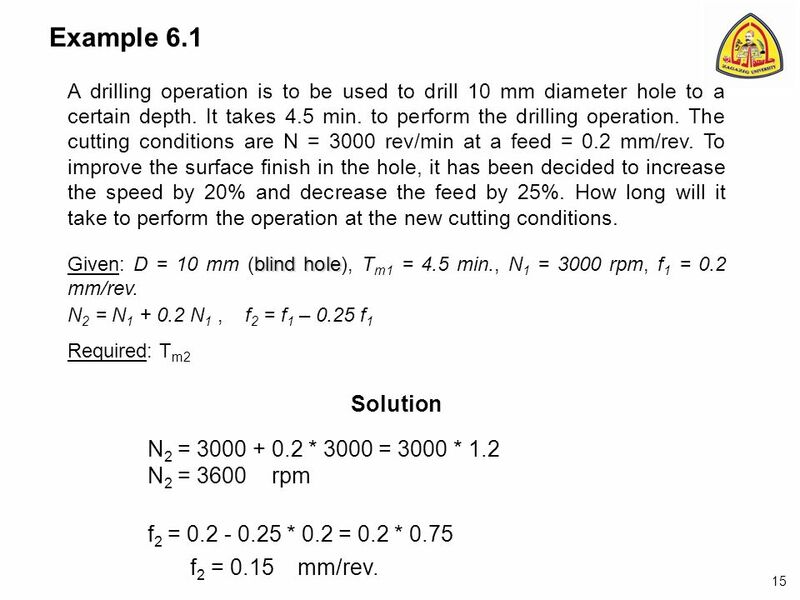 A drilling operation is to be used to drill 10 mm diameter hole to a certain depth. It takes 4.5 min. 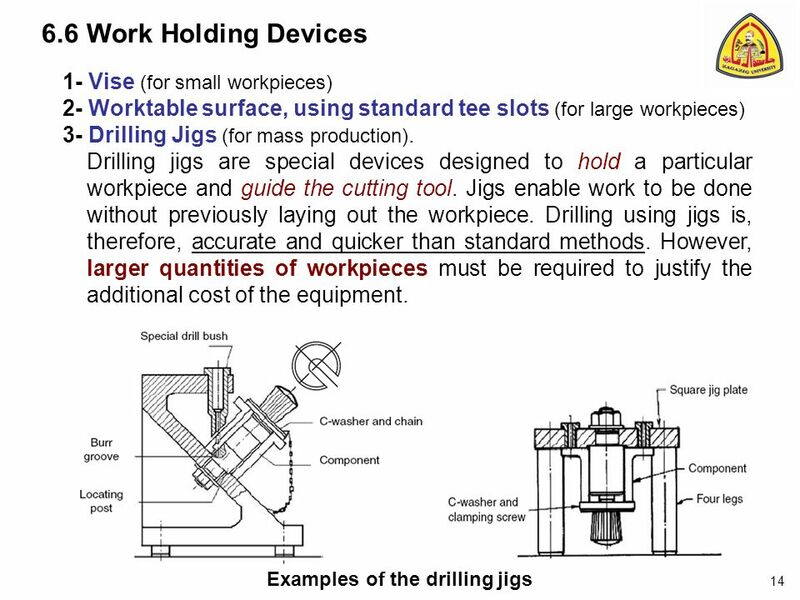 to perform the drilling operation. 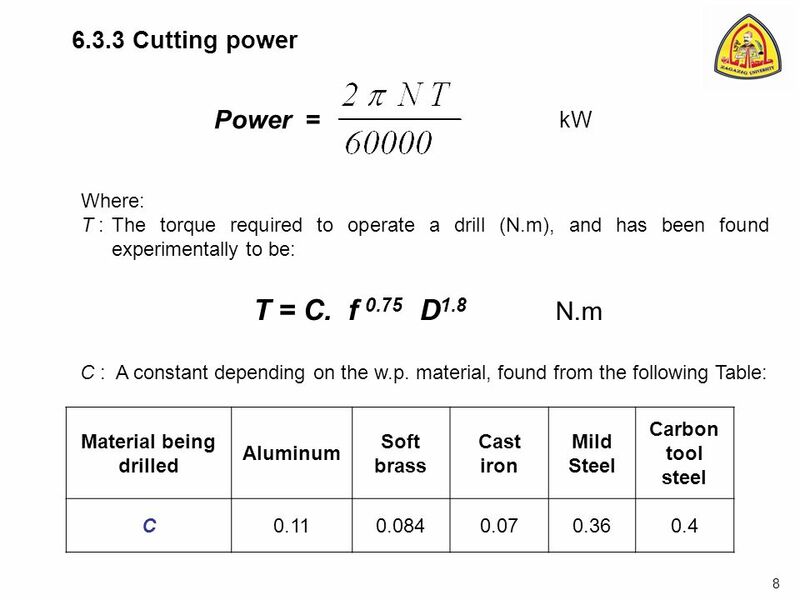 The cutting conditions are N = 3000 rev/min at a feed = 0.2 mm/rev. To improve the surface finish in the hole, it has been decided to increase the speed by 20% and decrease the feed by 25%. 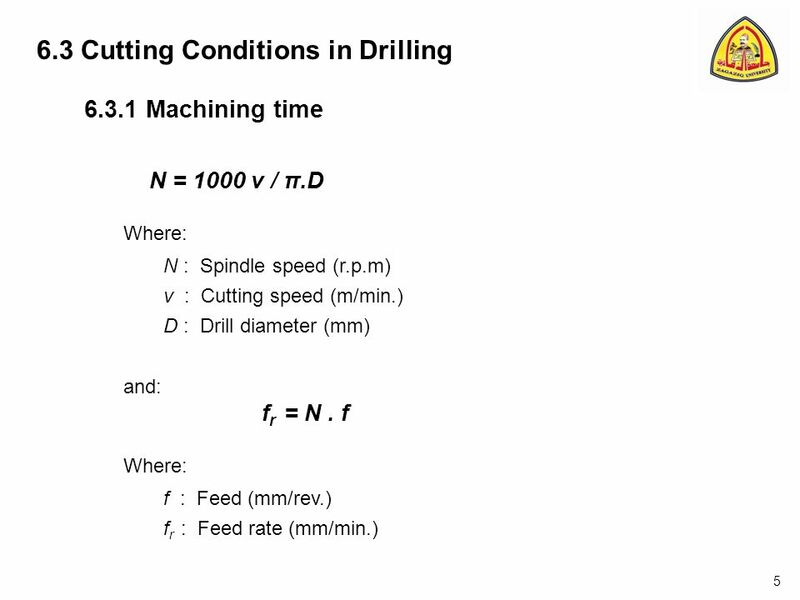 How long will it take to perform the operation at the new cutting conditions. 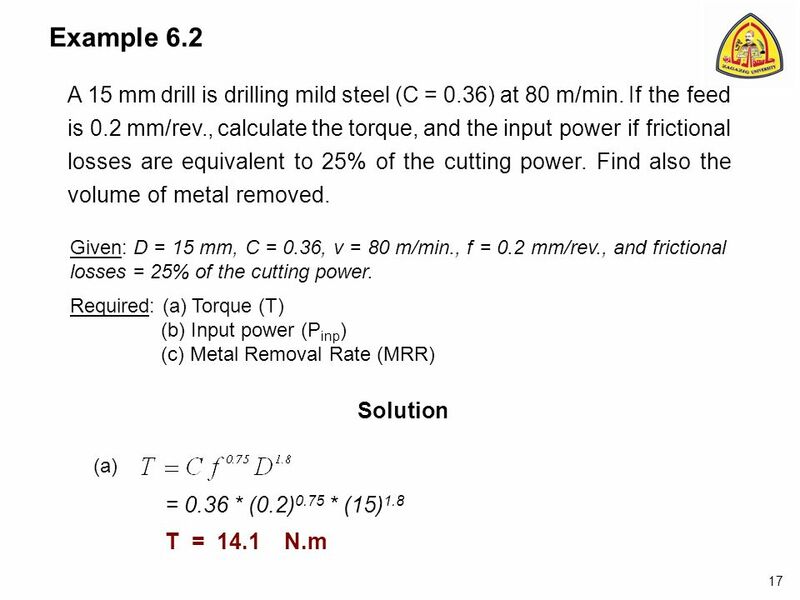 Given: D = 10 mm (blind hole), Tm1 = 4.5 min., N1 = 3000 rpm, f1 = 0.2 mm/rev. N2 = N N1 , f2 = f1 – 0.25 f1 Required: Tm2 Solution N2 = * 3000 = 3000 * 1.2 N2 = rpm f2 = * 0.2 = 0.2 * 0.75 f2 = mm/rev. 16 fr2 = N2 f2 fr2 = mm/min. From 1st step: Tm1 = d / fr1 4.5 = d / (3000 * 0.2) d = mm. 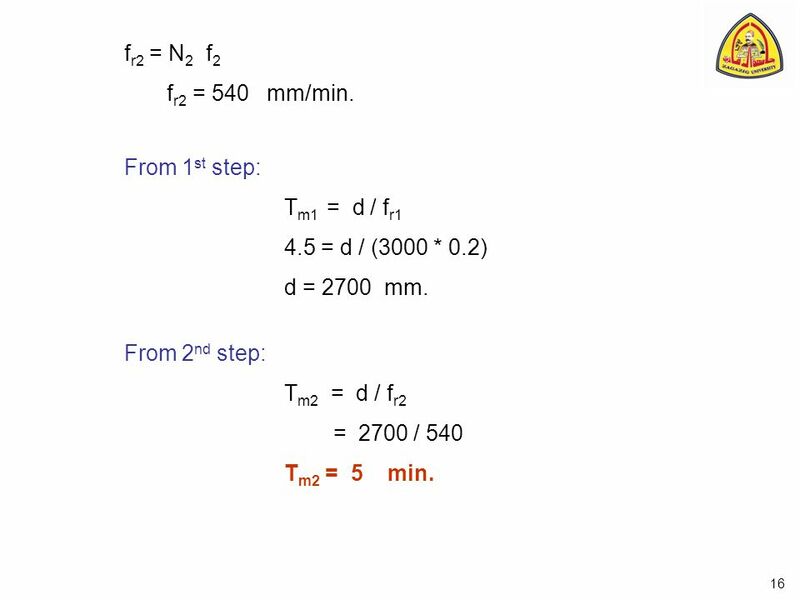 From 2nd step: Tm2 = d / fr2 = / 540 Tm2 = min. 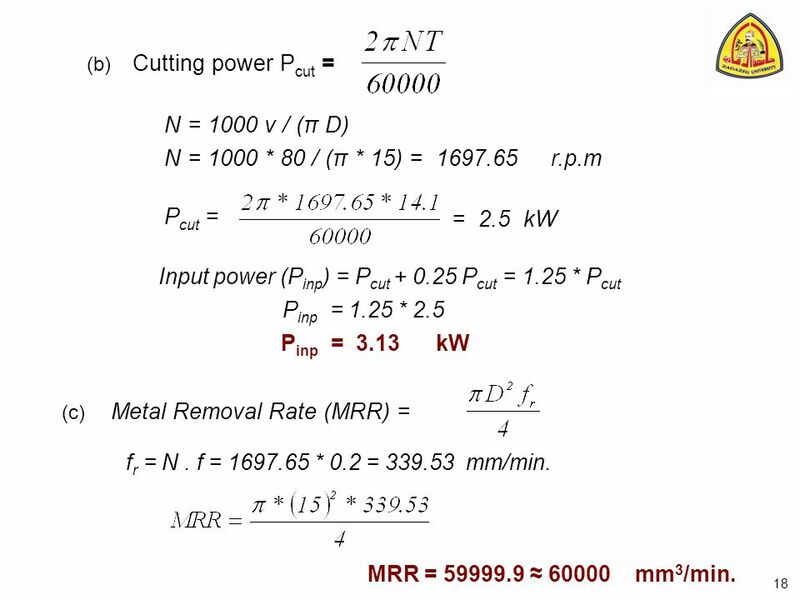 (b) Cutting power Pcut = N = 1000 v / (π D) N = 1000 * 80 / (π * 15) = r.p.m Pcut = = kW Input power (Pinp) = Pcut Pcut = 1.25 * Pcut Pinp = 1.25 * 2.5 Pinp = kW (c) Metal Removal Rate (MRR) = fr = N . f = * 0.2 = mm/min. 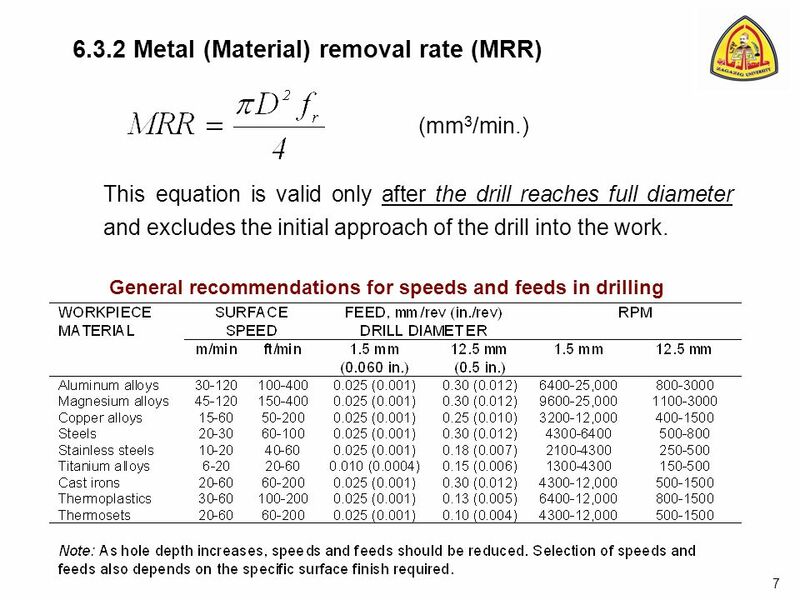 MRR = ≈ mm3/min. 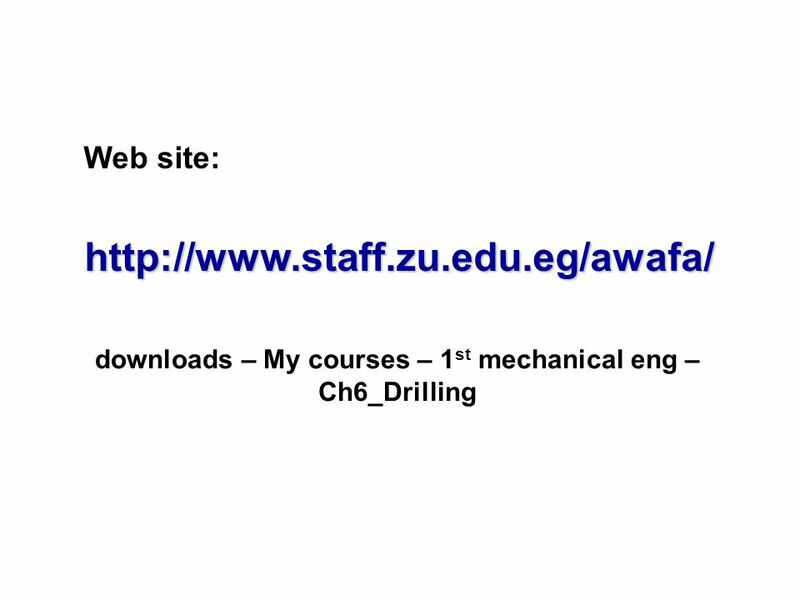 Download ppt "CHAPTER (6) Drilling Dr. Ahmed Abou El-Wafa." DRILLING MACHINE Dept. of Mech & Mfg. Engg..
Machining Precise material removal to bring a part to specified size Automotive machining examples Boring cylinders Honing cylinders Grinding cranks and. 4.1Basic principles The process of metal removal goes back many years. It is a process in which a wedge-shaped tool engages a work piece to remove a layer. Manufacturing Rounded Shapes II Manufacturing Processes. 1- Pipsqueak Engine Millwork on uprights and base. MACHINE TOOL Prof. kiran gore. SalahGasim Ahmed MET MET 103 Dr. Salah Gasim Ahmed ACX F 92.